I just finished reading the first volume of Proust's Remembrance of Things Past, aka In Search of Lost Time. I've meant to read it for ages--I bought it back when I still lived in Chicago, and it's moved from place to place, always sitting on my to-be-read shelf. This year, when I packed up my apartment, I cast a harsh eye on that shelf, and forced myself to pick out the books that I was determined to read during the upcoming year, and to donate the remainder. I decided that Proust (I seem only to own the first two volume) was finally going to be cracked, so it came with me to Chicago, and now the first volume, at least, to Moscow. "...what most enraptured me were the asparagus, tinged with ultramarine and pink which shaded off from their heads, finely stippled in mauve and azure, through a series of imperceptible gradations to their white feet--still stained a little by the soil of their garden-bed--with an iridescence that was not of this world. I felt that these celestial hues indicated the presence of exquisite creatures who had been pleased to assume vegetable form and who, through the disguise of their firm comestible flesh, allowed me to discern in this radiance of earliest dawn, these hinted rainbows, these blue evening shades, that precious quality which I should recognise again when, all night long after a dinner at which I had partaken of them, they played (lyrical and coarse in their jesting like one of Shakespeare's fairies) at transforming my chamber pot into a vase of aromatic perfume." I'm similarly both annoyed and attracted by the behaviors of the characters in the book. They're utterly annoying--but then I recognize their behaviors in myself and am disconcerted. And the very idea of the power of sense memory is of course brilliant. The famous moment comes when the narrator has not simply a cup of tisane, and not simply a madeleine, but the two in combination--and that combination of flavors and textures sends him back to a childhood memory that he'd lost. I was thinking about this tonight because one of my perpetual challenges when I come to Russia is to recapture a taste memory from my very first trip in 1992. That was a tough year, though I was lucky to be a vegetable lover living in a small city in southern Russia--we had a good market and so I ate pretty well through much of the fall. By December things were a little dire, but up to that point I was OK. Better than OK, in some ways. In the big main market there was a tiny stall--barely more than a hole in a wall--that sold only one thing: lavash. Not the thin lavash that seems to have made its way to the US: big rounds of maybe inch-thick wood oven baked bread. If I was lucky, the lavash was so fresh from the oven it was almost too hot to carry home. I ate it with everything: peanut butter until what I'd brought from home ran out, cheese, jam, adjik, which is a spicy condiment I'd buy at the market, too, or just plain. I adored the stuff. And I've never quite found its equal. I keep buying other varieties of lavash, but nothing's ever measured up to that. Tonight I bought the lavash I've been buying (I realize, according to its packaging, that this is apparently Georgian lavash, as opposed to Caucasian or central Asian), and I heated it for a while in a pan, but though it comes close, it doesn't quite manage it. I wonder if that stall's still there in the market in Krasnodar, or if now, 17 years later, that memory will never be exactly replicated? And just because I can't post a post without a picture, I'll probably also never find another image as surreal as the yellow Mercedes with an angry cat painted on its side. But that doesn't mean I won't try to capture the other semi-insane varieties of painte cars I still see here. For example, this one was parked up at the top of Vorobevy gory last weekend. Even crazier was the car with an image of what seemed to be a pile of snakes and skulls. But I didn't have my camera with me for that one, so this will have to do. A relatively quick summer knit this year were these fingertipless gloves. I wrote about them a bit before the film festival, and then actually finished all the finishing (heh) of them shortly thereafter. It just took me a while to photograph them. 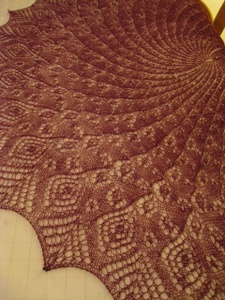 They're based on the Mahayana Flying Glove pattern, which is itself based on the Leyburn sock pattern. Honestly, I pretty much only took the cast on number of stitches and then the stitch pattern from these two patterns. As written, they're pretty much straight tubes, but I thought those would be too bulky around my wrists (not that I've got tiny wrists, but, still). So, I decreased every few rows to make a narrower wrist, and then increased slightly more quickly to make the hand roomier. Honestly, I probably didn't need to increase for the hands as much as I did; they're a little bit baggy in the palms. Still, I basically like the fit quite a bit. The other difference was making the finger... tubes. I simply did what one would do to make gloves, but only knit a small (and, sadly, not always equal) number of rows. Although I initially thought I'd do a sewn bind-off, I ended up with a simply passed over bind off, because I kind of liked the strong edge. But what I really, really like about these is the pattern. Never have I so much liked the combination of variegation and pattern. To my eye, the pattern brings out the color differences in particularly interesting ways; I never expected it to be so complementary. Speaking of which, last night I threw together something that was unexpectedly complementary and delicious: cauliflower, chick peas, and pasta. This made two generous servings; I was going to take a picture of my leftovers, but suddenly, I discovered, I'd eaten them ALL here at my desk before I got the camera out. and a couple of spoonfuls, or a splash, of the pasta cooking water. Cover, and let saute/steam while the pasta finishes. When the pasta's al dente, mostly drain it, and mix together the pasta with a bit of the remaining water and the cauliflower/chick pea mixture. (This would be best done in the skillet, because then you get any little pieces stuck to the pan; my pan wasn't big enough, though, so I ended up having to use the pasta cooking pot for the mixing). Serve with grated cheese, salt and pepper. Seriously, this might not sound good, but it really, really was. I didn't even think it would be--I was worried by a too strong smell of cauliflower when I got to the pasta cooked part; but instead, it was just tender and yummy. It's funny that this article showed up today, because I've just been thinking about soft-serve ice cream. Yes, incidentally, I do realize that that's an odd thing to be thinking about. What can I say? Monday evening, after I dropped friends off at the airport (good to see you guys! ), I stopped at IKEA on my way home. I failed to buy what I wanted, because I hadn't really measured the space into which I want to put a shelf, and thus wasn't sure if anything would fit. Anyway, it was a tiny, tiny shop that sold frozen custard, with the classic option of dipping the custard into melted chocolate (or other flavors?) which then formed a hard shell around the ice cream. I've got sort of vague, scattered memories of it. I think I remember that I didn't really like the hard shell thing, and tended to get my frozen custard without it. (I was a kid who didn't really like my foods mixing or touching each other... I've totally grown out of that, fortunately.) I did, though, like watching the process of dipping. I think I remember bicycling over there as a family, because I remember we had these battery-powered lights that strapped on to your arm to wear when biking after dark (and Chicago's summer nights aren't as long as the summer nights here... that's the problem with being at the far eastern end of a time zone). But I don't really have a memory of how often we did this, or if the biking thing was normal or unusual (it was on kind of a busy street, so I'm just not sure), or what. Seriously, I've been thinking about ice cream so much over the last couple of days that I almost bought an ice cream maker yesterday. I spent more than two hours at the Russian Consulate yesterday, in a humid, overcrowded, unpleasant room, waiting in line to get some paperwork I need to get permanent residency (that is, "landed immigrant" status) here (apparently the Canadian government worries that my completely uneventful life in the US is just a cover for nefarious activities abroad). I should perhaps mention that it's entirely possible I could have cut to the front of the line, but I was brought up to respect lines. In fact, I may respect lines too much, because I get really, really annoyed when others don't. This is why I identified with Liz Lemon on 30 Rock, because she's getting really, really annoyed with line scoflaws in her first appearance on the show. (I'd put a link, but I can't find it on youtube, and since I'm in Canada I can't look at anything on nbc.com or hulu.) Oh, and I should also mention that the man who ended up helping me was very, very nice, even if the cost of the document I needed magically went up from $10 to $40 between a phone call last week and my trip there yesterday, which necessitated running between the consulate and a bank downstairs, since they only accept money orders. ARGH. Anyway, on my way home from the consulate I stopped in a Williams Sonoma and gazed at an ice cream maker. And then realized that I sort of on principle don't really buy anything there unless it's on sale, since everything always seems to be more expensive there than it is elsewhere. So instead, perhaps I'll treat myself to ice cream more often. I go through a lot of phases of enthusiasm for different things, in all sorts of spheres of life. I wonder, sometimes, if this is in part a side effect of being single--I get to choose my food and entertainment, and thus am only guided by whatever my current enthusiasm is. Anyway, I tend to go through phases for different breakfasts--I'll eat one cereal for a year, then switch to another one. Or I go through phases when I very frequently make the same dish. Sometimes it's a matter of expediency, like during graduate school when I went through first a macaroni and cheese phase (made yet simpler when a friend pointed out that you could make it without butter and milk by just saving a little of the pasta boiling water, which gives the cheeze powder a bit of body) and then a scrambled eggs mixed with fresh salsa from Hyde Park Produce (huh... I just googled them to see if they have a website, and they don't, but there's this, which is sort of interesting, too... and going to its current entries reminds me of another phase, the summer in graduate school I spent mostly at Promontory Point, alternating swimming with German homework, after which someone said I looked "tan and rested," which I may never have been since then) eaten over whole wheat toast phase. In recent years I've been going through a lengthy beet phase. Mostly a roasted beet phase, except for my time in Russia, when the garlicky beet salad was very much in my regular rotation at the cafeteria at the Lenin library. Much more often, though, I like my beets roasted, in part because they taste good, but also in part because it's fun (and messy) to slip off their skins. They're wonderful with strong flavors like blue cheese, walnuts, and balsamic vinegar. Very recently I've been going through a cauliflower phase. This is surprising, because even though my tastes have broadened considerably over the years, I had somehow managed to maintain the thought that I didn't really like cauliflower, even if there were a couple of individual dishes involving cauliflower I do like. And, honestly, this lasted until this past holiday season, when I actually ate a piece of raw cauliflower and realized that, actually, I do liked cauliflower. So I've been mostly making a bastardized version of aloo gobi, based--yes, seriously--on a dvd extra from Bend it Like Beckham. But with some major differences, based on what I usually have around, and on the fact that I often throw in a can of chickpeas, which means that it becomes... something else. And for the this past year I've been going through a huge sweet potato "fry" phase. In other words, sweet potatoes (wait, have I already blogged about this? if so, sorry) cut into fry like shapes, tossed with a bit of oil, spread on a baking sheet and put in a fairly hot oven until done. Here, they've then been sprinkled with a bit of fleur de sel and a Penzey's herb mix called "mural of flavors," which is really very good. I love these so much I'd eat them every day if I weren't worried that that would make me sick to my stomach. But I think they probably would, so I don't. I'll also go through entertainment-based phases, like when I'll "discover" an author and then read every book that person's written all in a row. This has been more something I've done since leaving Chicago and moving to places with easier to use public libraries (probably it'd now be easier in Chicago, too, but when I left I never went to the Hyde Park branch of the library). Over the last few years I've tended to go through summer entertainment phases, too, based largely on Netflix, initially. It's something caused by a somewhat more relaxed schedule combined with my desire to knit combined with my desire to be entertained while knitting combined with the lack of anything on TV in the summer combined with TV shows on DVD. I haven't really had that since moving here, in part because I've only been around for partial summers and in part because there is no Netflix here (and the copycat version, though it now has a similar "unlimited" rental plan, also makes you pay if the post office loses a DVD, which I fear is likely to make the service less cost effective for me as a subscriber, so, hmpf). But remember how I off-handedly mentioned I'd been watching a bunch of Doctor Who while knitting? HOLY CRAP, you guys, I have just spent the last week and a half being completely obsessed with the new Doctor Who, thanks to youtube. I've watched every episode now, plus assorted supplementary behind the scenes videos and the like. No clue. It's got the combination of utter silliness, frequent scariness, and moments of joy and woe that for some reason I find very appealing, in much the same way as Buffy the Vampire Slayer, back in the day. So, to end, here's the first part of a great episode, which has a bit of the silliness, a LOT of the scariness (but not gross scariness), and a bit of the joy and woe. Also, for what it's worth, this new obsession (which is likely to pass soon, because there's nothing new to see--the final episode of the season, which played in Britain Saturday evening, was already up on youtube within an hour or so of its ending) does NOT really extend to the show's spin off, Torchwood. That has redeeming moments, but is just not nearly as good, I think in large part because it doesn't have the silly part down as well. Well, maybe not. But it was very good, and very, very easy. 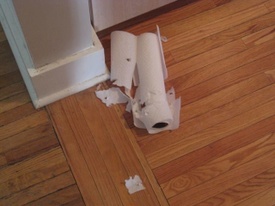 And I have no pictures, because when I made it I was SO HUNGRY I ate it all right up. So, there's this recipe I've made a number of times from a Jacques Pepin cookbook, involving trout (though I usually use salmon), mushrooms, leeks, chives, and baking. It's excellent, but certainly not a thing to make for one or two. Sunday I experimented with a stove top version, and it turned out so well I thought I'd write about it. This made two servings, but could easily be changed to more or less, given a big enough pan. a chunk of salmon big enough for two good-sized portions. And then a bit of olive oil, salt, and pepper. The instructions aren't much more complicated. 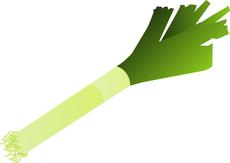 Slice the leek thinly, and wash well (leeks can be sort of sandy/dirty between their layers, so give them a good swish). Heat a pan of reasonably large diameter (and which has a lid) over medium heat. Add a bit of olive oil (a tablespoon or so), and a bit of salt and pepper. Add the leeks, and sauté, stirring, for a minute or two. 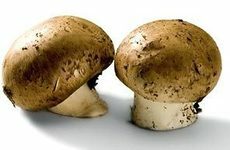 Add the mushrooms, and continue to sauté, stirring, for another minute or two. Then mostly cover the pan (turn the heat down a mite at this point--you should hear things moving along in the pan, but you also don't want it to be too hot) and let cook for about 10-12 minutes, checking occasionally to make sure that a) the mushrooms don't exude too much water--you want the liquid that gathers to be nice and mushroomy, not too watery, so if it seems too watery cook with the lid off for a bit, but also that b) they don't dry out, and some liquid remains in the bottom of the pan. At this point, push the mushrooms to the outer edge of the pan, letting the liquid gather in the middle. Then plop the piece of salmon down on the liquid. Cover, and let poach/steam/whatever it's doing for 4-5 minutes. Then turn the salmon over and cook (covered) another 4-5 minutes, or until just about cooked through. Uncover the pan, and let the juices burble up and reduce a bit, until the salmon's done. And... eat. Eat it all right up. I had it with green beans and crusty country bread, toasted. I think it'd be lovely with some simple diced boiled potatoes, too. 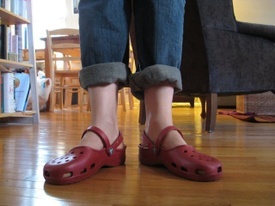 My Colorado relatives have been singing the praises of Crocs since before I left. And I just yesterday finally acquired my first pair. (Costco! Woohoo!) I know, I know. So late! But. They are, indeed, great. I've barely had them off since getting them home. So, thanks for the recommendation, and sorry it took me so long to convert! 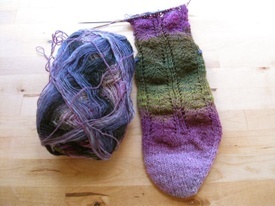 I have another foot-related thing to show, a pair of socks in the new super fancy Noro sock yarn. Pretty! The color way, with the purple/pinks and the greens made me think of spring, which is actually coming now. Despite my "blah" post from Friday, the weekend was quite nice and sunny. There's still little in the way of blooming anything (hey, I haven't seen any forsythia here, which saddens me), but I'm sure that's coming. At least, I assume that Canadians plant bulbs and the like. Anyway, the pattern I'm using is a variation on the "Broad Ripple" pattern; I'm doing them toe up, which changes the orientation of the chevrons. And I'm purling a few stitches to give it a bit of ribbing. And, biggest new thing for me, I'm attempting to make them footed. That is, there will be distinct left and right foot socks--I'm hoping this will help solve the problem of holes in the toes that I've been having. OK, and one more thing. This totally and completely amuses me. Since getting back from Russia, I've been shopping at Costco a lot. And in order to deal with the large quantities of food one sometimes acquires at Costco, I've also gotten a vacuum sealer in order to freeze more efficiently. In general, it's great. However. Here's a hint. 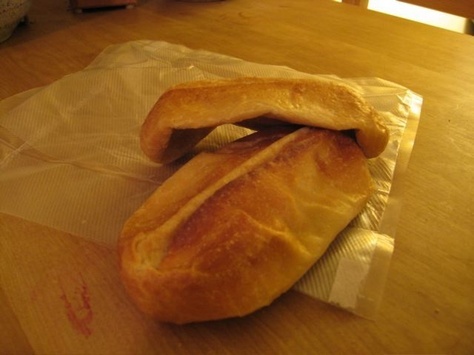 Bread doesn't vacuum seal well. These started out as cute little demi-baguettes. And they turned into... man, I don't even know what.